NEW YORK -- Minnesota's Karl-Anthony Towns and Philadelphia's Joel Embiid are holding out hope that they will be named as All-Star reserves Thursday. If not, they have a consolation prize. Towns and Embiid were both named on Wednesday to the rosters for the Rising Stars Challenge. The game features some of the NBA's best rookies and sophomores and will be played Friday night of All-Star weekend in New Orleans. Towns is a member of a U.S. team that also includes Myles Turner, Devin Booker, Malcolm Brogdon, Marquese Chriss, Brandon Ingram, D'Angelo Russell,Frank Kaminskyand Jahlil Okafor. Embiid leads the World team with a roster includingNikola Jokic, Kristaps Porzingis, Emmanuel Mudiay, Jamal Murray, Dante Exum, Trey Lyles, Buddy Hield, Domantas Sabonis and Dario Saric. "As a rookie you've got to be really excited for the opportunity," said Hield, who will suit up on his own home court in New Orleans. "Growing up I saw many Rising Stars games. It was something I watched in the league since I was a little boy. It's always been on my bucket list to be a part of it." Hield is excited about his team's chances. "The World is stacked," said Hield, a native of the Bahamas. ESPN's Justin Verrier and The Associated Press contributed to this report. 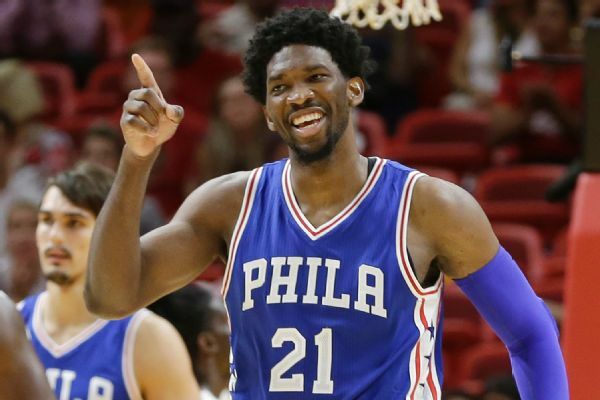 Marc Stein details why 76ers star Joel Embiid deserves an All-Star nod as a rookie.